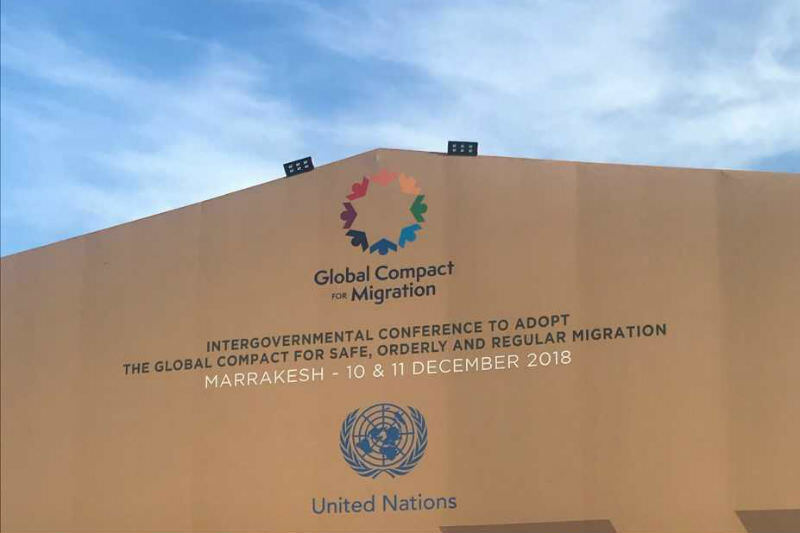 As more than 150 countries around the world moved ahead with the adoption of the Global Compact for Safe, Orderly and Regular Migration (GCM) last week in Marrakesh, Morocco, Australia and a few other countries fell behind, deciding not to adopt this pioneering global instrument. The GCM was adopted in Marrakesh at an intergovernmental conference under the auspices of the UN on 10 December 2018, Human Rights Day. This was a historic moment in the governance of international migration and an incredible milestone for international cooperation on the management of all dimensions of international migration across the globe. The adoption of the GCM marks the first time that the world's nations have come together in agreement on frameworks, principles, and concrete actions to deal with the growing complexity and scale of human mobility. The contents of the GCM represent the culmination of two years of hard work, debate, and good faith negotiations among UN member states, including Australia. To abandon the GCM is a loss for all the migrant women, men and children affected by human mobility, but also creates a strong signal that we no longer deem multilateralism as an appropriate or effective approach to global challenges. The compact counted on strong political support from many world leaders including Chancellor Angela Merkel, Belgium Prime Minister Charles Michael and the top dignitaries from Spain, Greece, Gabon, Panama amongst others. There was also unanimous support for the adoption of the GCM from the Asia Pacific region with all countries supporting the GCM, with the exception of Australia and Singapore, which abstained on their vote on the GCM at the UN General Assembly on 19 December in New York. Delegations from Thailand, Nepal, Cambodia, Japan, Korea, Indonesia Tuvalu and Fiji among other countries from our region expressed their support to the GCM as an important governance instrument in the Asia Pacific region. The Holy See was also one of the 'shakers and movers' in the negotiations and adoption of the GCM. Pope Francis reaffirmed the 20 points of action to welcome, protect, promote and integrate migrants and refugees. This strong show of support for the GCM took place at a time of increased nationalist rhetoric, populism and xenophobia. This makes the adoption of the GCM even more of a profound victory. Reaching this point would have been a dream only a few years ago. "Our government has sent the message that Australia doesn't need the rest of the world, nor the Asia Pacific region, for increased international cooperation on what is by definition a transnational, cross border reality." It is puzzling that a migrant nation whose spirit and soul is based on diversity and migration has decided to pull out of the GCM process. There is also an unequivocal call from the community in Australia to welcome migrants and refugees that our government has decided to ignore. Just a few weeks ago, more than 34 leaders from faith groups, migrant communities, peak bodies, academia and international NGOs wrote a public letter and press release to express our disappointment with the decision of the government to withdraw from the GCM. The decision of the Australian government not to adopt is even more absurd, considering that the GCM is a non-binding agreement and that member states can decide how they implement its 23 objectives to fit with their national realities. The GCM does not threaten sovereignty or the prerogatives of the state to control who comes into a territory. On the contrary, it states national sovereignty as one of its key guiding principles. The GCM represents a skilful balance that mediates between national sovereignty and the rights of migrants, refuges, people seeking asylum and other people on the move. I was honoured to be in Marrakech for the adoption of the compact and to be a part of the efforts of many civil society organisations that contributed to the consultations and attended the negotiations on the Compact. The GCM is indeed an amazing milestone. However the true test of its success lies in its actual implementation on the ground, to make a difference to the lives of people on the move and to ensure that the voices of women and girls in migration are also part of these efforts. Part of civil society's efforts in Marrakech included the launch of the Marrakech Women's Rights Manifesto for the adoption of the Compact to ensure that women are at the heart of decision making and implementation efforts. As civil society members and as Australians, we need to advocate for the adoption of the compact first. This only requires the government to notify that they are willing to adopt. We also need to advocate for the development of a concrete national action plan on the GCM that is also coherent with the adoption of the distinct and independent but complementary Global Compact on Refugees. As the rest of the world will now strive for the implementation of the GCM, Australia has decided to stay behind. Our politicians have stated that Australia already manages migration in a safe, orderly and regular manner. They have sent the misleading message that Australia doesn't need the rest of the world, nor the Asia Pacific region, for increased international cooperation on what is by definition a transnational, cross border reality. It is not too late for the Australian government to adopt the GCM. This is an instrument that they helped to shape through their active participation in the consultations and negotiations that resulted in the final text of the GCM. It is simply short-sighted and unjustified to pull out of the GCM. We must ask ourselves if this is the kind of country we want Australia to be. Carolina Gottardo is Director of Jesuit Refugee Service Australia. The text of the Global Compact for Safe, Orderly and Regular Migration can be accessed here. Main image: Site of the intergovernmental conference in Marrakesh at which the GCM was adopted. Recent articles by Carolina Gottardo. Thanks Carolina! I agree, "It is not too late for the Australian government to adopt the GCM. This is an instrument that they helped to shape through their active participation in the consultations and negotiations that resulted in the final text of the GCM. It is simply short-sighted and unjustified to pull out of the GCM. We must ask ourselves if this is the kind of country we want Australia to be." It is not the kind of Australia I want where we transfer desperate people who come here in boats to off-shore hell-holes and leave them there for years. Sadly Labor have joined the Coalition in keeping off-shore processing. All Labor had to do to stop the people smugglers was to retain boat turn-backs, but the Coalition seem to be desperately trying to wedge Labor on this and Labor politicians are too weak to stand up to the current Government's cruel immigration policies. Thanks, Carolina. I was unaware of any Global Compact for Safe, Orderly and Regular Migration (GMC). This may be a sign of my need to keep abreast of international diplomacy, or it could signify politicians' unwillingness to publicise what they see as topics that are too hard? (on both sides of the House?) How can Australia continue to stand outside, when countries like Germany (Angela Merkel) and other EU countries accepted the GMC. If Asia/Pacific countries (except Singapore and Australia) are in, we should be surely be with them! After all it is not a binding agreement! Indonesia are party to the GMC! My question: Is USA a party to the GMC? Thank you Carolina. I was not really aware of this move in UN. I am ashamed at the weakness and self-interestedness of our politicians. At 82 I feel a great urgency to try to influence events and to keep abreast. Thank you for your leadership at Jesuit Refugee Service. Good answer, thank you so much for the help!